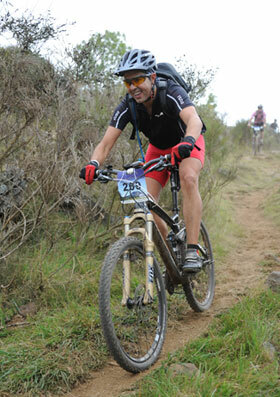 The ‘Transvolcanique 2011‘ has been, so far this year, one of the most challenging, yet enjoyable mountain bike events I have participated in. Despite the bad weather, they were two great action-packed days accompanied by amazing mountain landscape. The ‘Transvolcanique’ is a prestigious, well organised, non-for-profit MTB ride event in France that aims to promote the beauty of the region of ‘Auvergne’. It happens in the heart of Auvergne, right through the Volcanoes Natural Park and it lasts two days: Saturday and Sunday. It begins in the event host town: Blanzat and reaches Mont-Dore at the end of the first day to then make the way back to Blanzat from there the second day. The most stunning sights throughout this two-days ride is a line of extinct volcanoes often on sight that seem to be adorning the country mountain lanes, meadows and valleys. The spectacular unspoilt-looking beauty of this landscape us captivating. The total distance for this two-day ride is about 170kms and the total ascent is 3500 metres. The latter makes this ride particularly difficult. I had been looking forward to participating in it for about 7 years, finding it always difficult to be physically prepared after the summer months. The terrain is very diverse, but mostly mountain lanes and unpaved mountain tracks, although the usual rough and dirty track downhill areas are not missing either. Bring tyres ready for mud if you decide to join in next year. If you however the type looking for really complex and highly technical MTB circuits, this ride is not for you as this more like a marathon kind of MTB challenge. The charm of the Transvolcanique is rather on the accumulation of miles through endless uphill pedalling at the heart of the Massif Central in France: Auvergne. The fog, humidity, rain, mud and mist were not enough to stop 1400 mountain bikers to participate in this great MTB event. There were participants from more than 80 different departments, yet 400 entries remained on the waiting list hoping for last minute cancellations. The reputation of the Transvolcanique in the French Massif Central has even trespassed national borders with increasing participation from foreign participants being obvious in recent years, mainly from Belgium. The valleys and meadows of Auvergne, the steep climbs, the fast dirty track descents, the volcanoe sights, the smell of healthy cow poo and superb sportsmanship spirit of this MTB ride made ​​this weekend a unique experience of which I keep good memories. The first day began with the collection of bracelets and registration papers at Blanzat’s sport centre. The eagerness to start pedaling up the mountains were obvious amongst all riders. The day started fairly sunny, but as we gained altitude weather changed and the clouds soon overtook us. Although there were some moderate descents, most of the first day was spent going uphill. I soon realised that I should have trained a bit more on the weekends before the event. I however got to enjoy the ascent as I spent most of the day cycling next to Gihel and Aymeric, two cycling friends from the MTB club I am on in Ile-de-France. Architecture and natural beauty of Auvergne. The lonely and beautiful surroundings atop the mountain passes were often worth admiring and immortalise with photos. However the thick haze we were going through and headwind would stop most of the cyclists from stopping to take pictures. Everyone wanted to complete ascent as soon as possible and start going down. At 14.00 we stopped to have a hot meal at Nébouzat, courtesy of the organisation too. The food was plentiful and of very acceptable standards well considering that there were 1400 participants: ‘mousse de boeuf’, vegetables, ‘confit de canard’ and rice, and even cheese and 3 desserts to choose from. As you can imagine it was hard to carry on cycling after digesting all that. Some even indulged in some red wine. One of the things that fascinated me about cycling up the mountain passes and throughout the inactive volcanoes was to feel the mixture of thick mist and fog when going through the clouds settling on top of the mountains. As I was cycling through it, I could feel the dew from the clouds floating around me and holding onto clothes. It was cold! but I could not be bothered stopping to get my water-proof jacket out of my ‘camelbak’ and took the decision to carry on cyling hard despite my cold arms but at least to keep in the body warmth. All I could think of was a hot shower! Once we arrived and left behind the ‘Mont-Dore’ Falls, through a narrow rocky downhill lane, I arrived to a town that, to my surprise, turned out to be Mont-Dore. You can imagine my joy as I thought I still had 20kms to complete before reaching my destination. My Forerunner marked the wrong distance. End of first ‘etape’: Mont-Dore! At night, a friendly lad from St Etienne, Gihel, Aymeric and I enjoyed a carbo-rich dinner while discussing the usual mountain bike and cycling stuff. Here’s the metrics accomplished at the end of the day. El comienzo del segundo día fue duro: aunque nos levantamos a una hora bastante razonable: las 7, después de desayunar y prepararme, me dispuse a recoger mi bicicleta, y ‘oopps’, no podía reposar el trasero sobre el sillín de la bicicleta. Me llevo unos 20 minutos conseguir amoldar los cachetes del ‘culete’ al sillín de la bici. The first 12 kilometers on day 2 were almost a constant steep ascent where I could feel my body calories being burnt and my energy disipating. I had to cheat a bit and pull two gels out of my back pocket to be able to keep the rythm of the group I was with. Once we reached the top of the mountain, I knew it the worst was over, and I got rewarded with the stunning views of the ‘Banne d’Ordanches’. As I went through mountain meadows, the feeling of going through the thick morning mist and the sight of the hundreds of MTB bikers pedalling hard to reach the summit was amazing. Los primeros 12 kilómetros fueron prácticamente un constante ascenso quemando calorías, gastando fuerza física y tirando de gel energético. Después de esos primeros 12 kilómetros que aunque largos se hicieron bastante llevaderos debido a las impresionantes vistas de la ‘Banne d’Ordanches’, los prados de alta montaña, la impresión de estar en la nube y las hileras de BTTistas esforzándose por llegar a la cima. From this point onwards, almost the entire cycling journey was a continuous up and and down hills and little and passing through beautiful villages. I cycled most of the time with the same two of three groups of cyclists. My two other cycling friends were not as rush as they didnt have a train to take at 19.00 from Clermont-Ferrand to come back to Paris. The end of the second day was even more pleasant as the sun rose, and the landscape took on another dimension only to be expressed by the adjective ‘unique’. The icing on the second day was a very steep and technical 350m dirt and stoney track downhill over about 10kms which reminded me that I still had energy to play with the terrain, avoiding boulders, trying a little, ackward jump here and there and enjoying the all suspension abilities on new TREK. What a grand finale! pity that we didn’t get this descent at the beginning of the ride to be less tired and so be able to do it a little faster. After so many years living in France and wanting to do the Transvolcanique in Auvergne, this has been the mountain bike ride of the year for me. If you like long rides, steep ascents, cross-country cycling through valleys and mountains and a bit of up and down muddy, dirt tracks and to embellish your eyes with unique and unforgettable scenery, the ‘Transvolcanique’ 2012 for the year will be a good place to put on your sports calendar. 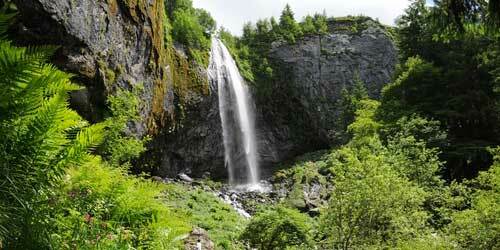 The National park of the volcanoes in Auvergne is an emblematic place with a touch of wilderness and unspoilt beauty. No wonder this place is so highly regarded in France by those that enjoy outdoors sports. I am also not surprised that subscriptions to the ‘Transvolcanique cycling ride’ get sold so quickly. What do cyclists get when signing up to the ‘Transvolcanique’? mark on the organization 2X 85 km. accommodation ‘Mont-Dore’ for participants and accompanying persons. stop midway through the first hot day to eat a lot. mechanical assistance if needed and free. care service by qualified personnel. It is not expensive, is it?. If you come with a partner, friends or family, there are also options for their accommodation for a small fee. Though they would need to make their way to Mont-Dore and back on their own. 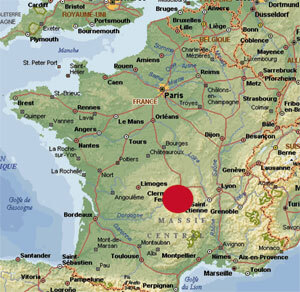 You have flights to Clermont-Ferrand from several UK cities. Ideally you would get to Clermont-Ferrand on Friday and check into a hotel in that town because there is no tourist accommodation in Blanzat. On Saturday morning you will need to get up early and cycle the easy, flat 10kms to Blanzat to start the ride, or rent a car and drive there where there is parking available for everyone. The ‘Transvolcanique’MTB ride, has been so far one of the greatest challenges I have gone through, and so I decided to use the opportunity to help raise funds to protect the endangered Asian Moon Bears in China and other parts of Southeast Asia. You can read about this project on my fundraising campaign website: campaign. Or if you prefer you can just watch this video to find out more about why I do this. And of course, if you decide to sponsor me, you know that you will be helping avoid the life agony and suffering of these majestic creatures: the Moon Bears. So far I have collected £ 232 (sterling), which is not to bad considering the initial campaign target was on £200. All funds the AnimalsAsia Charity Organisation. Silvia Guizzardi, Harriet Green, Jonathan Marsh, Emma McCluskey, Arlyn Bangcaya, Sandrine Mahieu, Barbara Dent, Nick Morgalla, Monique Caesar, Daniel Isabel, Paul Margerison, David Burgess, Lesley Granger, Michael Coyne, David Blundell, David Ramírez.